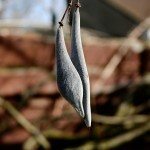 My wisteria is over 20 years old and has done beautifully for all that time. Our deck, which is near the wisteria, was replaced last summer. The original deck had a wood foundation and wood surface. The new deck has the same wood foundation but a trex-type surface. We are seeing some little leaves that look dry as opposed to normal sized leaves. I found the info on gall but do not see any signs of that. I appreciate your feedback. 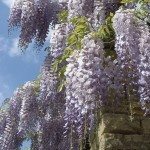 Here is a link that list common Wisteria problems.